I have a fun, healthy recipe for you below, but first a word or two about shrimp! According to the Environmental Defense Fund (EDF), shrimp can be eco-friendly if it’s farm raised the right way, and there are couple good wild options too. However, when you purchase shrimp that’s imported from Southeast Asia or Latin America, you’re buying from a source that may not always abide by environmental regulations. For best eco practices when it comes to shrimp, EDF recommends picking Oregon pink shrimp or spot prawns from Canada. Find out much more about the Eco-Best Shrimp and the Eco-Worst Shrimp. While one cup of shrimp fried rice can have as much as 26 grams of fat, it’s possible to do shrimp the healthy way! 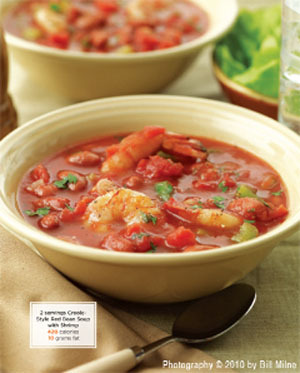 As a main course, the soup gives you the nutritional power of several vegetables, 5 grams fat per serving and great Creole-style taste. What more could you want? This sounds yummy! My husband loves shrimp, so I might just have to give it a try. Let me know how you like it! I have to admit to not being much of a shrimp eater at all. It’s something about the texture I think, but this does look good, for shrimp 😉 .